AWS Documentation » AWS IoT Greengrass » Developer Guide » What Is AWS IoT Greengrass? What Is AWS IoT Greengrass? AWS IoT Greengrass is software that extends cloud capabilities to local devices. This enables devices to collect and analyze data closer to the source of information, react autonomously to local events, and communicate securely with each other on local networks. AWS IoT Greengrass developers can use AWS Lambda functions and prebuilt connectors to create serverless applications that are deployed to devices for local execution. The following diagram shows the basic architecture of AWS IoT Greengrass. AWS IoT Greengrass makes it possible for customers to build IoT devices and application logic. Specifically, AWS IoT Greengrass provides cloud-based management of application logic that runs on devices. Locally deployed Lambda functions and connectors are triggered by local events, messages from the cloud, or other sources. In AWS IoT Greengrass, devices securely communicate on a local network and exchange messages with each other without having to connect to the cloud. AWS IoT Greengrass provides a local pub/sub message manager that can intelligently buffer messages if connectivity is lost so that inbound and outbound messages to the cloud are preserved. Through the secure authentication and authorization of devices. Through secure connectivity in the local network. Between local devices and the cloud. Device security credentials function in a group until they are revoked, even if connectivity to the cloud is disrupted, so that the devices can continue to securely communicate locally. AWS IoT Greengrass provides secure, over-the-air software updates of Lambda functions. Deployment and local execution of connectors and Lambda functions. Secure, encrypted storage of local secrets and controlled access by connectors and Lambda functions. MQTT messaging over the local network between devices, connectors, and Lambda functions using managed subscriptions. MQTT messaging between AWS IoT and devices, connectors, and Lambda functions using managed subscriptions. Secure connections between devices and the cloud using device authentication and authorization. Local shadow synchronization of devices. Shadows can be configured to sync with the cloud. Controlled access to local device and volume resources. Deployment of cloud-trained machine learning models for running local inference. Automatic IP address detection that enables devices to discover the Greengrass core device. 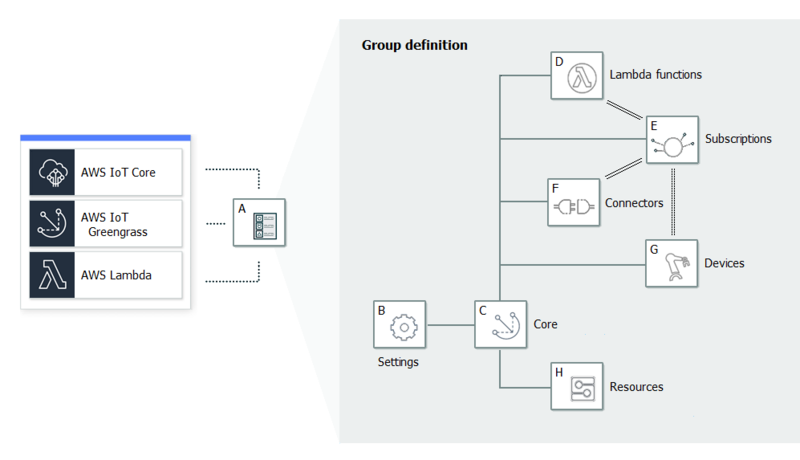 Central deployment of new or updated group configuration. After the configuration data is downloaded, the core device is restarted automatically. Secure, over-the-air software updates of user-defined Lambda functions. AWS IoT Greengrass core instances are configured through AWS IoT Greengrass APIs that create and update AWS IoT Greengrass group definitions stored in the cloud. The following tabs describe what's new and changed in AWS IoT Greengrass core software versions. General performance improvements and bug fixes. Configurable default access identity for Lambda functions in the group. This group-level setting determines the default permissions that are used to run Lambda functions. You can set the user ID, group ID, or both. Individual Lambda functions can override the default access identity of their group. For more information, see Setting the Default Access Identity for Lambda Functions in a Group. HTTPS traffic over port 443. HTTPS communication can be configured to travel over port 443 instead of the default port 8443. This complements AWS IoT Greengrass support for the Application Layer Protocol Network (ALPN) TLS extension and allows all Greengrass messaging traffic—both MQTT and HTTPS—to use port 443. For more information, see Connect on Port 443 or Through a Network Proxy. Predictably named client IDs for AWS IoT connections. This change enables support for AWS IoT Device Defender and AWS IoT Lifecycle events, so you can receive notifications for connect, disconnect, subscribe, and unsubscribe events. Predictable naming also makes it easier to create logic around connection IDs (for example, to create subscribe policy templates based on certificate attributes). For more information, see Client IDs for MQTT Connections with AWS IoT. Greengrass connectors provide built-in integration with local infrastructure, device protocols, AWS, and other cloud services. For more information, see Integrate with Services and Protocols Using Greengrass Connectors. AWS IoT Greengrass extends AWS Secrets Manager to core devices, which makes your passwords, tokens, and other secrets available to connectors and Lambda functions. Secrets are encrypted in transit and at rest. For more information, see Deploy Secrets to the AWS IoT Greengrass Core. Support for a hardware root of trust security option. For more information, see Hardware Security Integration. Isolation and permission settings that allow Lambda functions to run without Greengrass containers and to use the permissions of a specified user and group. For more information, see Controlling Execution of Greengrass Lambda Functions by Using Group-Specific Configuration. You can run AWS IoT Greengrass in a Docker container (on Windows, macOS, or Linux) by configuring your Greengrass group to run with no containerization. For more information, see Running AWS IoT Greengrass in a Docker Container. MQTT messaging on port 443 with Application Layer Protocol Negotiation (ALPN) or connection through a network proxy. For more information, see Connect on Port 443 or Through a Network Proxy. The Amazon SageMaker Neo deep learning runtime, which supports machine learning models that have been optimized by the Amazon SageMaker Neo deep learning compiler. For information about the Neo deep learning runtime, see Runtimes and Precompiled Framework Libraries for ML Inference. Support for Raspbian Stretch (2018-06-27) on Raspberry Pi core devices. The AWS IoT Device Tester for AWS IoT Greengrass, which you can use to verify that your CPU architecture, kernel configuration, and drivers work with AWS IoT Greengrass. For more information, see AWS IoT Device Tester for AWS IoT Greengrass User Guide. The AWS IoT Greengrass Core Software, AWS IoT Greengrass Core SDK, and AWS IoT Greengrass Machine Learning SDK packages are available for download through Amazon CloudFront. For more information, see AWS IoT Greengrass Downloads. Lambda executables that run binary code on the Greengrass core. Use the new AWS IoT Greengrass Core SDK for C to write Lambda executables in C and C++. For more information, see Lambda Executables. Optional local storage message cache that can persist across restarts. You can configure the storage settings for MQTT messages that are queued for processing. For more information, see MQTT Message Queue. Configurable maximum reconnect retry interval for when the core device is disconnected. For more information, see the mqttMaxConnectionRetryInterval property in AWS IoT Greengrass Core Configuration File. Local resource access to the host /proc directory. For more information, see Access Local Resources with Lambda Functions. Configurable write directory. The AWS IoT Greengrass core software can be deployed to read-only and read-write locations. For more information, see Configure a Write Directory for AWS IoT Greengrass. Performance improvement for publishing messages in the Greengrass core and between devices and the core. Reduced the compute resources required to process logs generated by user-defined Lambda functions. AWS IoT Greengrass Machine Learning (ML) Inference is generally available. You can perform ML inference locally on AWS IoT Greengrass devices using models that are built and trained in the cloud. For more information, see Perform Machine Learning Inference. Greengrass Lambda functions now support binary data as input payload, in addition to JSON. To use this feature, you must upgrade to AWS IoT Greengrass Core SDK version 1.1.0, which you can download from the AWS IoT Greengrass Core SDK downloads page. Reduced the overall memory footprint. Performance improvements for sending messages to the cloud. Performance and stability improvements for the download agent, Device Certificate Manager, and OTA update agent. Over-the-air (OTA) update agent capable of handling cloud-deployed, Greengrass update jobs. The agent is found under the new /greengrass/ota directory. For more information, see OTA Updates of AWS IoT Greengrass Core Software. Local resource access feature allows Greengrass Lambda functions to access local resources, such as peripheral devices and volumes. For more information, see Access Local Resources with Lambda Functions. Deployed AWS IoT Greengrass groups can be reset by deleting Lambda functions, subscriptions, and configurations. For more information, see Reset Deployments. Support for Node.js 6.10 and Java 8 Lambda runtimes, in addition to Python 2.7. Copy certificates from the /greengrass/configuration/certs folder to /greengrass/certs. Run /greengrass/ggc/core/greengrassd instead of /greengrass/greengrassd. Deploy the group to the new core. An AWS IoT Greengrass group is a collection of settings and components, such as an AWS IoT Greengrass core, devices, and subscriptions. Groups are used to define a scope of interaction. For example, a group might represent one floor of a building, one truck, or an entire mining site. The following diagram shows the components that can make up an Greengrass group. A collection of information about the AWS IoT Greengrass group. AWS IoT Greengrass group role. Certification authority and local connection configuration. AWS IoT Greengrass core connectivity information. Default Lambda runtime environment. For more information, see Setting Default Containerization for Lambda Functions in a Group. CloudWatch and local logs configuration. For more information, see Monitoring with AWS IoT Greengrass Logs. The AWS IoT thing that represents the AWS IoT Greengrass core. For more information, see Configure the AWS IoT Greengrass Core. A list of Lambda functions that run locally on the core, with associated configuration data. For more information, see Run Lambda Functions on the AWS IoT Greengrass Core. A subject, which is an MQTT topic or topic filter that's used to filter message data. For more information, see Greengrass Messaging Workflow. A list of connectors that run locally on the core, with associated configuration data. For more information, see Integrate with Services and Protocols Using Greengrass Connectors. A list of AWS IoT things (devices) that are members of the AWS IoT Greengrass group, with associated configuration data. For more information, see Devices in AWS IoT Greengrass. A list of local resources, machine learning resources, and secret resources on the AWS IoT Greengrass core, with associated configuration data. For more information, see Access Local Resources with Lambda Functions, Perform Machine Learning Inference, and Deploy Secrets to the AWS IoT Greengrass Core. When deployed, the AWS IoT Greengrass group definition, Lambda functions, connectors, resources, and subscription table are copied to an AWS IoT Greengrass core device. A core is an AWS IoT device that runs the AWS IoT Greengrass core software, which enables it to communicate directly with the AWS IoT and AWS IoT Greengrass cloud services. A core has its own certificate used for authenticating with AWS IoT. It has a device shadow and exists in the AWS IoT device registry. AWS IoT Greengrass cores run a local Lambda runtime, a deployment agent, and an IP address tracker that sends IP address information to the AWS IoT Greengrass cloud service to allow Greengrass devices to automatically discover their group and core connection information. For more information, see Configure the AWS IoT Greengrass Core. Connected devices (also called Greengrass devices) can connect to a core in the same Greengrass group. Greengrass devices run Amazon FreeRTOS or use the AWS IoT Device SDK or AWS IoT Greengrass Discovery API to get the connection information for the core. Devices have their own certificate for authentication, device shadow, and entry in the AWS IoT device registry. For more information, see Module 4: Interacting with Devices in an AWS IoT Greengrass Group. In a Greengrass group, you can create subscriptions that allow devices to communicate over MQTT with Lambda functions, connectors, and other devices in the group, and with AWS IoT or the local shadow service. MQTT messages are routed through the core. If the core device loses connectivity to the cloud, devices can continue to communicate over the local network. Devices can vary in size, from smaller microcontroller-based devices to large appliances. The following table shows how these device types are related. Core device certificate in /greengrass/certs - The core device certificate is named hash.cert.pem (for example, 86c84488a5.cert.pem). This certificate is used to authenticate the core when connecting to the AWS IoT and AWS IoT Greengrass services. MQTT core server certificate in /greengrass-root/ggc/var/state/server - The MQTT core server certificate is named server.crt. This certificate is used for mutual authentication between the local MQTT service (that's on the Greengrass core) and Greengrass devices before messages are exchanged. Use the AWS SDK to build applications that interact with any AWS service, including Amazon S3, Amazon DynamoDB, AWS IoT, AWS IoT Greengrass, and more. In the context of AWS IoT Greengrass, you can use the AWS SDK in deployed Lambda functions to make direct calls to any AWS service. For more information, see AWS SDKs. The AWS IoT Device SDK helps devices connect to AWS IoT or AWS IoT Greengrass services. Devices must know which AWS IoT Greengrass group they belong to and the IP address of the AWS IoT Greengrass core that they should connect to. Although you can use any of the AWS IoT Device SDK platforms to connect to an AWS IoT Greengrass core, only the C++ and Python SDKs provide AWS IoT Greengrass-specific functionality, such as access to the AWS IoT Greengrass Discovery Service and AWS IoT Greengrass core root CA downloads. For more information, see AWS IoT Device SDK. The AWS IoT Greengrass Core SDK enables Lambda functions to interact with the Greengrass core, publish messages to AWS IoT, interact with the local shadow service, invoke other deployed Lambda functions, and access secret resources. This SDK is used by Lambda functions that run on an AWS IoT Greengrass core. For more information, see AWS IoT Greengrass Core SDK. The AWS IoT Greengrass Machine Learning SDK enables Lambda functions to consume machine learning models that are deployed to the Greengrass core as machine learning resources. This SDK is used by Lambda functions that run on an AWS IoT Greengrass core and interact with a local inference service. For more information, see AWS IoT Greengrass Machine Learning SDK. Using the AWS SDKs, you can build applications that work with any AWS service, including Amazon S3, Amazon DynamoDB, AWS IoT, AWS IoT Greengrass, and more. In the context of AWS IoT Greengrass, you can use the AWS SDK in deployed Lambda functions to make direct calls to any AWS service. For more information, see SDKs for Greengrass Lambda Functions. The AWS IoT Device SDKs helps devices connect to AWS IoT or AWS IoT Greengrass services. Devices must know which AWS IoT Greengrass group they belong to and the IP address of the AWS IoT Greengrass core that they should connect to. Although you can use any of the AWS IoT Device SDKs to connect to an AWS IoT Greengrass core, only the C++ and Python Device SDKs provide AWS IoT Greengrass-specific functionality, such as access to the AWS IoT Greengrass Discovery Service and AWS IoT Greengrass core root CA downloads. For more information, see AWS IoT Device SDK. The AWS IoT Greengrass Core SDK enables Lambda functions to interact with the AWS IoT Greengrass core on which they run in order to publish messages, interact with the local Device Shadow service, or invoke other deployed Lambda functions. This SDK is used exclusively for writing Lambda functions running in the Lambda runtime on an AWS IoT Greengrass core. For more information, see SDKs for Greengrass Lambda Functions. Using the AWS SDKs, you can build applications that work with any AWS service, including Amazon S3, Amazon DynamoDB, AWS IoT, AWS IoT Greengrass, and more. In the context of AWS IoT Greengrass, you can use the AWS SDK inside deployed Lambda functions to make direct calls to any AWS service. The AWS IoT Greengrass Core SDK enables Lambda functions to interact with the AWS IoT Greengrass core on which they run in order to publish messages, interact with the local Device Shadow service, or invoke other deployed Lambda functions. This SDK is used exclusively for writing Lambda functions running in the Lambda runtime on an AWS IoT Greengrass core. Lambda functions running on an AWS IoT Greengrass core can interact with AWS cloud services directly using the AWS SDK. The AWS IoT Greengrass Core SDK and the AWS SDK are contained in different packages, so you can use both packages simultaneously. You can download the AWS IoT Greengrass Core SDK from the AWS IoT Greengrass Core SDK downloads page. The AWS IoT Greengrass Core SDK only supports sending MQTT messages with QoS = 0. This allows you to test your Lambda functions in the cloud and migrate them to AWS IoT Greengrass with minimal effort. The AWS IoT Greengrass core software is supported on the platforms listed here, and requires a few dependencies. You can download the core software from the AWS IoT Greengrass Core Software downloads. Architecture: ARMv7l; OS: Linux; Distribution: Raspbian Stretch, 2018-06-29. Other versions might work with AWS IoT Greengrass, but we recommend this because it is the officially supported distribution. Windows, macOS, and Linux platforms can run AWS IoT Greengrass in a Docker container. For more information, see Running AWS IoT Greengrass in a Docker Container. Linux platforms can run AWS IoT Greengrass using the Greengrass snap, which is available through Snapcraft. For more information, see AWS IoT Greengrass Snap Software. Minimum 128 MB RAM allocated to the AWS IoT Greengrass core device. Linux kernel version 4.4 or later: Other versions might work with AWS IoT Greengrass, but for optimal security and performance, we recommend version 4.4 or later. The minimum required version is 3.17. Glibc library version 2.14 or later. The /var/run directory must be present on the device. AWS IoT Greengrass requires hardlink and softlink protection to be enabled on the device. Without this, AWS IoT Greengrass can only be run in insecure mode, using the -i flag. /dev/stdin, /dev/stdout, and /dev/stderr must be enabled. To run AWS IoT Greengrass with containers, the Linux kernel must support cgroups. The memory cgroup must be enabled and mounted to allow AWS IoT Greengrass to set the memory limit for Lambda functions. The root certificate for Amazon S3 and AWS IoT must be present in the system trust store. The devices cgroup must be enabled and mounted if Lambda functions with Local Resource Access (LRA) are used to open files on the AWS IoT Greengrass core device. Python version 2.7 is required if Python Lambda functions are used. If so, ensure that it's added to your PATH environment variable. NodeJS version 6.10 or later is required if Node.js Lambda functions are used. If so, ensure that it's added to your PATH environment variable. Java version 8 or later is required if Java Lambda functions are used. If so, ensure that it's added to your PATH environment variable. The following commands are required for Greengrass OTA Agent: wget, realpath, tar, readlink, basename, dirname, pidof, df, grep, and umount. Architecture: ARMv7l; OS: Linux; Distribution: Raspbian Stretch, 2018-06-29. While several versions may work with AWS IoT Greengrass, we recommend this as it is the officially supported distribution. Linux kernel version 4.4 or greater: while several versions may work with AWS IoT Greengrass, for optimal security and performance, we recommend version 4.4 or greater. The minimum required version is 3.17. Glibc library version 2.14 or greater. The ggc_user and ggc_group user and group must be present on the device. The Linux kernel must support cgroups. NodeJS version 6.10 or greater is required if Node.JS Lambda functions are used. If so, ensure that it's added to your PATH environment variable. Java version 8 or greater is required if Java Lambda functions are used. If so, ensure that it's added to your PATH environment variable. You can choose to use Raspbian Stretch instead of Jessie. Using Stretch will require additional memory set-up. For more information, see this step. OpenSSL 1.01 or greater is required for Greengrass OTA Agent as well as the following commands: wget, realpath, tar, readlink, basename, dirname, pidof, df, grep, and umount. Linux kernel version 4.4 or later. Although several versions might work with AWS IoT Greengrass, for optimal security and performance, we recommend version 4.4 or later. The sqlite3 package is required for AWS IoT device shadows. Make sure it’s added to your PATH environment variable. Python version 2.7 is required if Python Lambda functions are used. If so, make sure that it's added to your PATH environment variable. Node.js version 6.10 or later is required if Node.js Lambda functions are used. If so, make sure that it's added to your PATH environment variable. Java version 8 or later is required if Java Lambda functions are used. If so, make sure that it's added to your PATH environment variable. OpenSSL 1.01 or later is required for Greengrass OTA Agent as are the following commands: wget, realpath, tar, readlink, basename, dirname, pidof, df, grep, and umount. You can use the following information to find and download software for use with AWS IoT Greengrass. 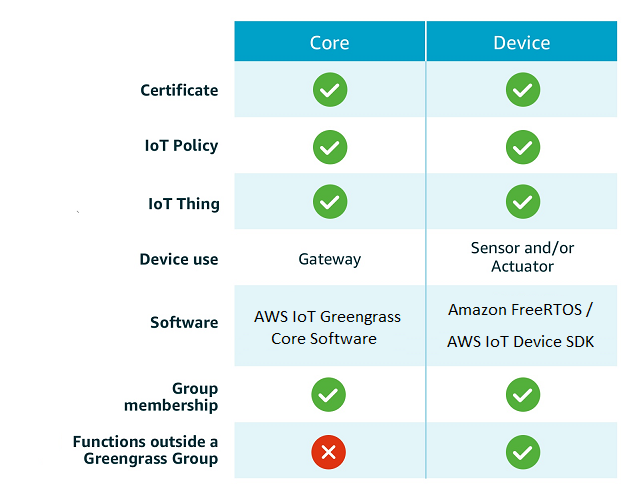 The AWS IoT Greengrass core software extends AWS functionality onto an AWS IoT Greengrass core device, enabling local devices to act locally on the data they generate. To install Greengrass on your core device, download the package for your architecture and distribution, and then follow the steps in the Getting Started Guide. By downloading this software you agree to the Greengrass Core Software License Agreement. The AWS IoT Greengrass Core SDK enables Lambda functions to interact with the AWS IoT Greengrass core on which they run. Download the SDK for your language or platform. v1.1.0 - Current version (on GitHub). The AWS IoT Greengrass snap software download makes it possible for you to run AWS IoT Greengrass on Linux cloud, desktop, and IoT environments through convenient containerized software packages. These packages, or snaps, contain the AWS IoT Greengrass software and its dependencies, and can be downloaded and used on your Linux environments as-is. The AWS IoT Greengrass snap is updated automatically with new versions of the AWS IoT Greengrass core software and associated dependencies. You can turn off these automatic updates at any time. The AWS IoT Greengrass snap is configured to use default Greengrass user and group configurations. This allows it to work easily with Greengrass groups or Lambda functions that run as root. If you need to use Greengrass groups or Lambda functions that do not run as root, you need to update these configurations and add them to your system. The AWS IoT Greengrass snap uses many interfaces that must be connected before it can operate normally. These interfaces are connected automatically during setup. If you use other options while you set up your snap, you might need to connect these interfaces manually. For more information about the AWS IoT Greengrass snap and these modifications, see Greengrass Snap Release Notes. Use the download link to install snapd version 2.38 or later. If you need to use Greengrass groups or Lambda functions that do not run as root, update your default Greengrass user and group configurations, and add them to your system. For more information about updating user and group configurations with AWS IoT Greengrass, see Setting the Default Access Identity for Lambda Functions in a Group. The --dangerous flag interferes with the AWS IoT Greengrass snap's ability to connect its required interfaces. If you use this flag, you need to manually connect the required interfaces using the snap connect command. For more information, see Greengrass Snap Release Notes. Your Greengrass setup is now complete. You can now use the AWS IoT Greengrass console, AWS REST API, or AWS CLI to deploy the Greengrass groups associated with this snap. For information about using the console to deploy a Greengrass group, see the Deploy Cloud Configurations to an AWS IoT Greengrass Core Device. For information about using the CLI or REST API to deploy a Greengrass group, see CreateDeployment in the AWS IoT Greengrass API Reference. For more information about configuring local resource access with snap AppArmor confinement, using the snapd REST API, and configuring snap interfaces, see Greengrass Snap Release Notes. The AWS IoT Greengrass Docker Software download enables you to run AWS IoT Greengrass in a Docker container. Instructions are provided in the Docker file. To help you get started quickly and experiment with AWS IoT Greengrass, AWS also provides a prebuilt Docker image that has the core software and dependencies installed. For more information, see Running AWS IoT Greengrass in a Docker Container. The AWS IoT Greengrass Machine Learning SDK enables the Lambda functions you author to consume the machine learning model available on the device. We welcome your feedback. To contact us, visit the AWS IoT Greengrass Forum.